The President of the Alvaralice Foundation was awarded for her amazing work on Cali´s social development. 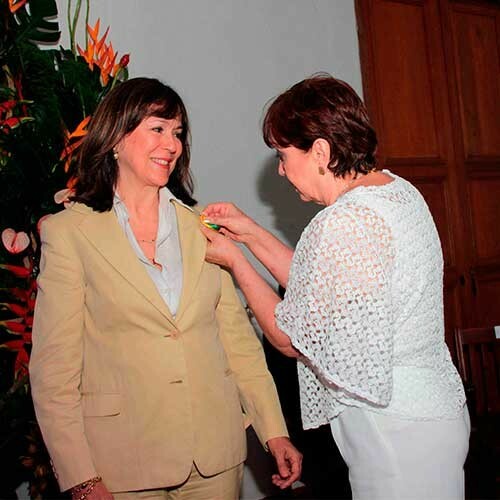 On June 9, 2016 , Maria Eugenia Garcés Echavarria, the president of the Alvaralice Foundation, was awarded by the Society of Public Improvements with the Medal of Merit for her work on social development of Cali and the region. Her work benefits and strengthens communities with limited resources. Other receipients of the medal were: Maria Isabel Gutierrez Martinez, the Cisalva Director; Sixta Paz de Aljure , Director of the Department of the Society of Public Improvements; Emilio Aljure Nasser , former rector of the National University and Valle University; the artist Oscar Muñoz and Fanalca Foundation. At the same event, the former Mayor of Cali, Rodrigo Guerrero Velazco , received the Civic Medal.